According to the Occupational Safety and Health Administration (OSHA), 1 in 10 construction site workers are injured every year. Many of these injuries are due to equipment malfunction, failure or improper operation. Equipment injuries are often severe, resulting in mounting health care bills and severe pain and suffering. Workers' compensation does not cover damages for pain and suffering. If you have suffered a construction equipment injury, you may be able to collect damages, financial compensation for the damage you've endured, temporary or permanent. Do not assume that an accident is your fault. Call The Law Office of Robert Dunne, LLC for a free consultation at 212-551-1750 or contact me online. Knowing who may be held liable for your injuries is not easy. With numerous trades on the site -- plumbers, electricians, HVAC, carpenters and masons -- there is a lot going on during any given day and an equipment injury can result. Was the forklift operator licensed? 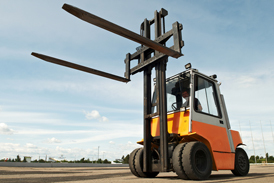 Had the forklift been properly maintained? Was the load too heavy? A load that exceeds weight capacity can cause injury. Was a Lull used to lift or hoist a load where a crane should have been used? Should the Lull have been used at all? Was the piece of equipment in question defective and/or dangerous? In my many years as a construction accident attorney, I have handled injury cases due to improper hoisting, lulls tipping over due to excessive weight, driver ejection and other equipment problems.